Oh Instagram. Love it or hate it it’s here to stay. Even THAT bloody algorithm. When I first began blogging in June 2017 one the of the first things I did was to switch my Instagram account over to a ‘business account’. Having a business account gives brands and bloggers / content creators / Influencers (what ever you want to call yourself) a number of features not available on a personal account. 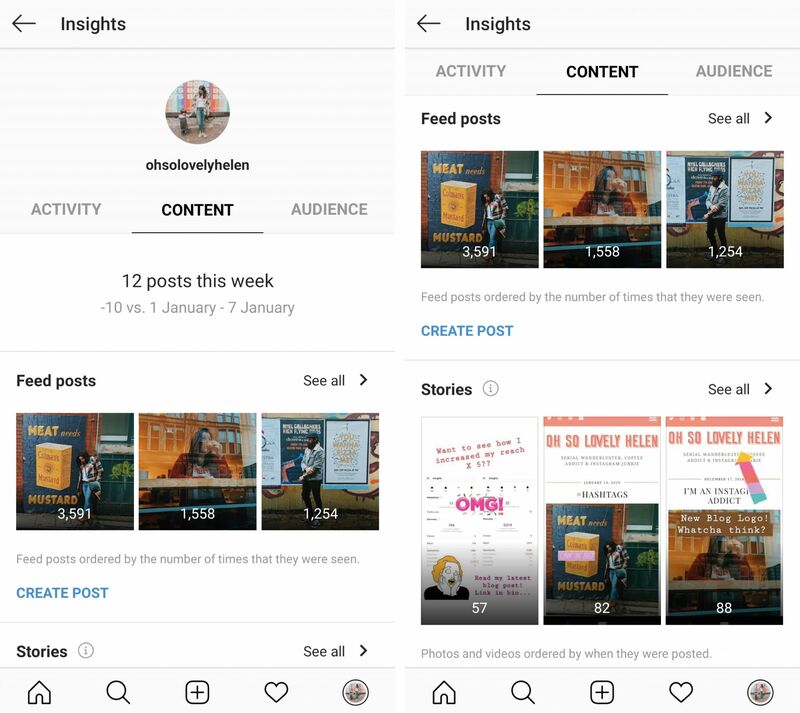 This relatively new feature known as ‘Insights‘ gives you access to in-app metrics such as the top locations and age of your followers plus how many people have visited your profile, which photos are preforming better than others and the ultimate time to post stats. 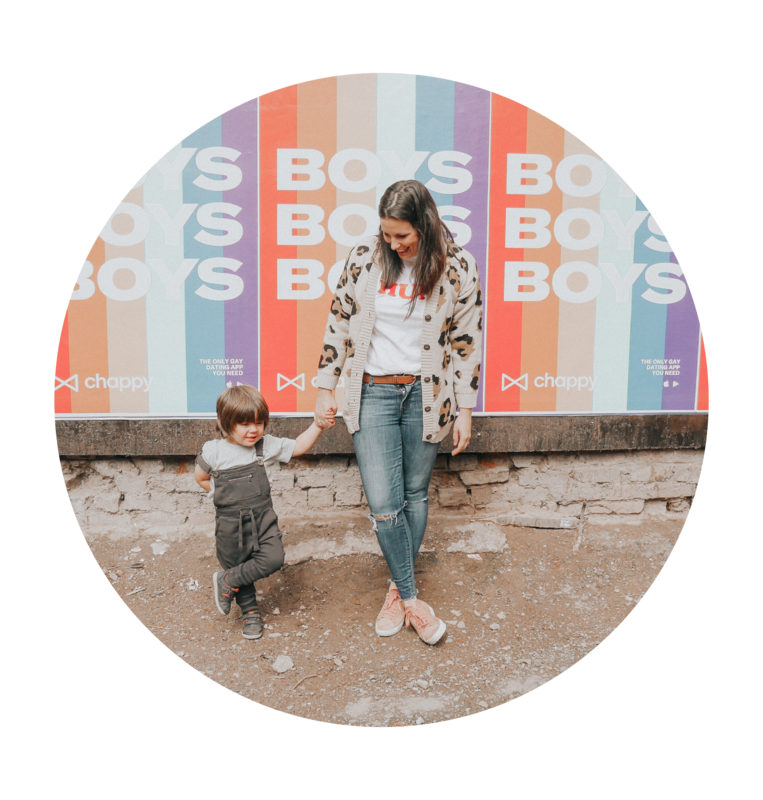 If you don’t have a business account or haven’t fully explored this amazing tool then lets take a look and analyse this photo of Sebastian and I. Here you can see that 233 people liked it and thats all the info you are given on a personal account. Once I click on ‘Insights’ I am given the below metrics! As well as 233 likes, there are 16 comments, 1 save, 25 profile visits and 1 click to what ever blog post was in my bio. Reach – The number unique accounts that have seen your post. 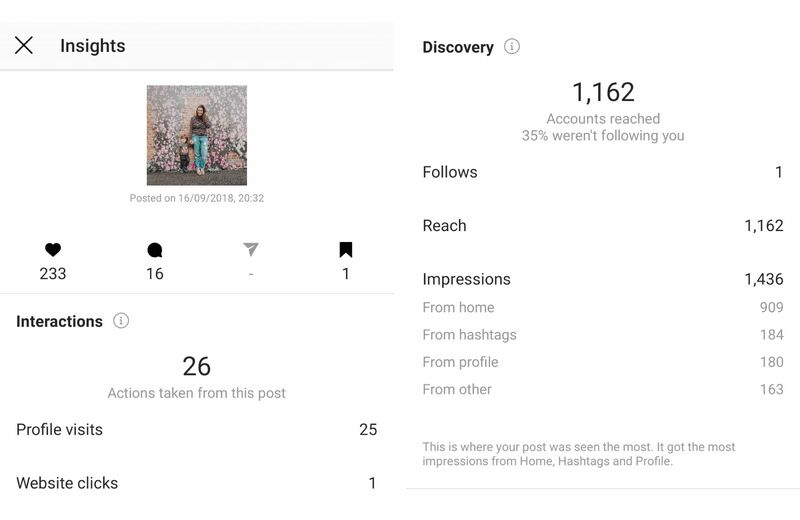 Impressions – The total number of times that your post has been seen – via home, hashtags and profile. Follows – The number accounts that started following you. So looking at my photo 35% of people who saw this post weren’t following me! 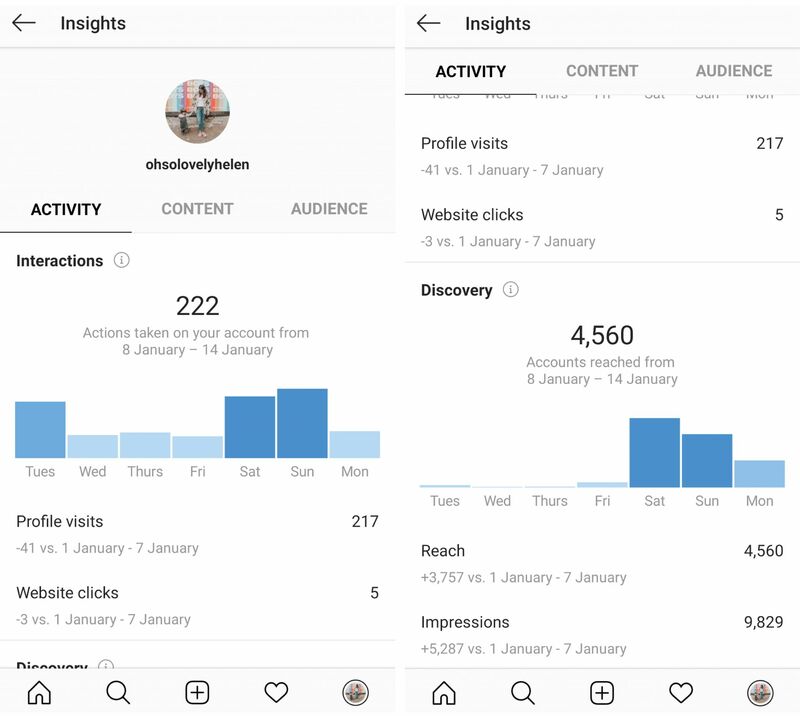 You can also see an overview of the past 7 days – this includes audience demographics and the optimum time and day to post! I’ve had a great week this week with reach and impressions as I have recently upped my hashtag game! I’ve written a blog post about it here. I’m still pretty crap when it comes to stories. Surprisingly I am a little bit shy and the thought of speaking on camera fills me with dread! Hence why the numbers on these are C.R.A.P! According to these analytics my optimum posting time is in the evening on either a Monday or Friday! It’s very rare that I post on a Sunday as I feel my posts get lost into the Instagram abyss and quite often they go straight into the archive! 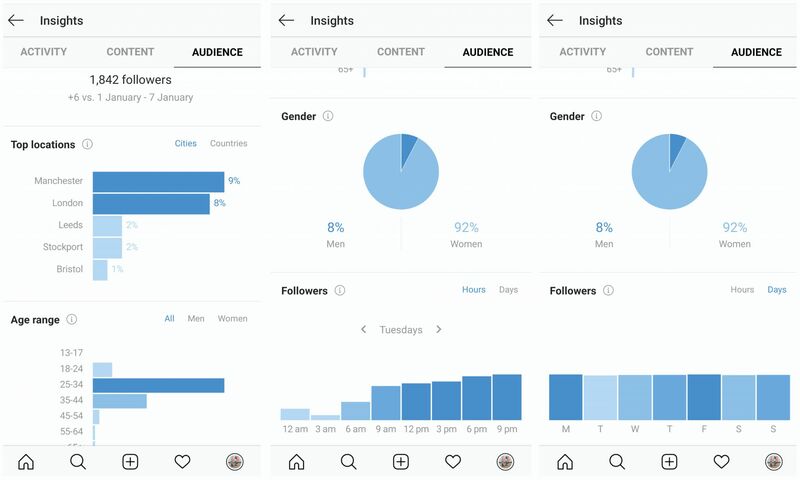 This data is a key tool as by knowing the times of day your followers are most active, you can adjust your posting schedule accordingly. Hello a boost in engagement! Not everyone is a fan of this feature but I love it. It’s a great tool to have, especially if you work with brands as those extra snippets of info are really beneficial. If you want to stand out from the crowd, offer brands more information other than ‘likes’ then I highly recommend you switch plus it’s FREE! How to make your Instagram highlight covers sassy AF. I found this post so useful! Recently switched over to a business account and didn’t have a clue what most of this stuff meant. So thanks! Thank you for taking the time to comment! I’m glad you found it useful – hopefully it will help!